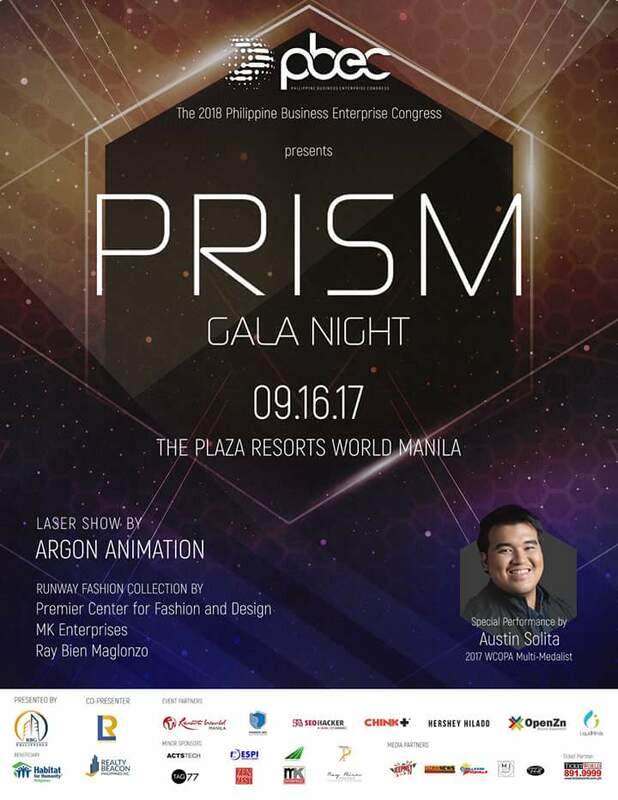 In an effort promote the biggest business event of 2018, RBG Philippines Inc. presented PRISM: 1st Annual Philippine Business Enterprise Congress (PBEC) Gala Night last September 16, 2017 at The Plaza, Resorts World Manila, Pasay. Three of the exceptional speakers in the upcoming PBEC were present during the soft launch; Ms. Hershey Hilado, an entrepreneur and business strategist, Mr. Sean Si, Internet Marketing Specialist and Mr. Raymond Lim, a high-impact trainer and business coach, giving the audience sneak peeks to their business talks on April 14 next year. The event’s objective is to officially introduce PBEC to the public and to build connections and create opportunities for the event stakeholders. PRISM is an event of expanding and forming an innovative business network and linkages of diverse industries and businesses. Special guests and performances from world class Filipino talents heated up the night. PRISM featured a fashion show of 3 collections by Filipino designers, (MK Enterprises, Premiere Fashion Center for Fashion and Design and Rey Bien Maglonzo, a spectacular performance of flashing lights and dancing lasers by Argon Animation, a show stopping performance from a multi-awarded Filipino singer, Mr. Austin Solita and more. 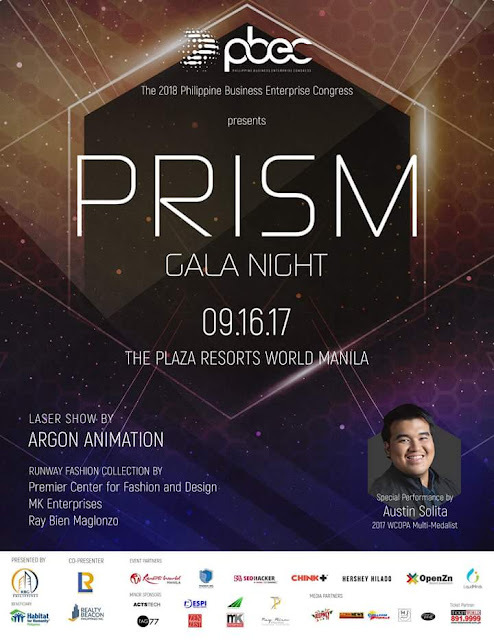 PRISM: PBEC Gala Night is presented by RBG Philippines; co-presented by, Realty Beacon Philippines Inc. and Raymond Lim SG; in Partnership with, SEO Hacker, Hershey Hilado, Resort World Manila, 1Punch Inc., OpenZN, LiquidMinds Inc., Tagcash and Nic Satur Events Management. Media partners: Jeepney TV, DZRH News Television, Fab Manila and Wazzup Pilipinas; and sponsors, Actstech, Espi Travel And Tours, and Zenzest. The 1st annual Philippine Business Enterprise Congress is a one-day symposium where more than 1000 businessmen, entrepreneurs and professionals from diverse industries gather to experience entrepreneurial convention, to explore boundless business opportunities and to discover fresh, innovative, efficient business concepts, strategies, and ideas devised by world class experts. RBG Philippines Inc. is a real estate investment company which specializes in facilitating business and entrepreneurial events like Money Making Muscles, Business Action Program, Leadership Action Program and more. With its goal to help existing and aspiring businessmen and entrepreneurs in building and managing a successful business, PBEC was created.